After eight years, EuroGoTV has shut down. “We started just as a place where the go-player could watch instruction videos and video reports, but soon EuroGoTV changed to a real go-news site with live video streaming,” writes founder Harry Weerheijm in the final edition of EuroGo TV’s email newsletter on May 27. Nearly 3,000 tournament reports were published on the EuroGoTV website, including tens of thousands of photos of go events across Europe. EuroGoTV regularly streamed live video of tournament games and posted “over 900 videos” on YouTube, according to Weerheijm (right). EuroGoTV’s newsletter was widely ready by go players throughout Europe and was a reliable source of European go news for the E-Journal. Ultimately, the burdens of the time and energy necessary to run EuroGoTV combined to make continuing the service untenable for Weerheijm, who also expressed disappointment that more go players didn’t pay to access the videos and that tournament organizers rarely used EuroGoTV as a tool to attract sponsors. He thanked his partner Judith van Dam, Catalin Taranu 5p, Peter Dijkema, Olivier Dulac, and EuroGoTV’s VIP members for their support for the project. 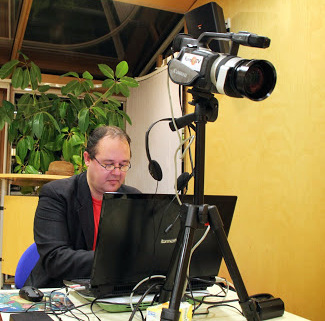 The EJ plans to continue covering the European go scene through the efforts of European Correspondent, Kim Ouweleen. Anyone interested in joining that team can email journal@usgo.org. The EJ is also in the process of developing plans for video coverage from this year’s US Go Congress; stay tuned for updates on that effort soon.